When is the Khan vs Lo Greco fight? 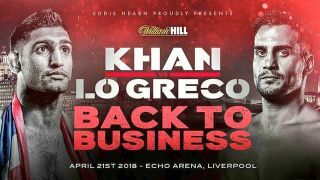 Amir Khan and Phil Lo Greco will go head-to-head at the Echo Arena in Liverpool, UK tonight. The fight will begin at 10pm BST in the UK, 5pm ET and 2pm PT. It's fight night! Ever since winning a silver medal at the Olympics in 2004, Amir Khan has been a popular fighter in the UK, Pakistan and around the world. However, after being soundly defeated by Saúl “Canelo” Álvarez in Las Vegas back in 2016, boxing fans have wondered if he still has what it takes. Khan will have a chance to prove that he does tonight when he goes up against Canadian Phil Lo Greco in the welterweight “Back To Business” fight. This will be his first fight since being knocked out by Álvarez and the excitement grew to fever pitch when Khan lost his temper with Lo Greco at a press conference back in January. If you’re wondering how you’re going to tune in to the fight, we’ll tell you which broadcasters will be showing it and walk you through the best options for streaming it online. Whether you're in the UK, Canada, US, or anywhere else we’ll point you towards the relevant stations around the world. And even if your corner of the Earth isn't showing it, we'll tell you how to tune into an international broadcast instead. The Khan vs Lo Greco fight is scheduled to begin around 10pm BST in the UK. Keep reading and we’ll show you all of the live streaming options available. If you're in the UK and already subscribe to Sky Sports then you're in luck. Unlike a lot of the biggest boxing bust ups, Khan vs Lo Greco isn't on pay-per-view. Watching the event directly on Sky will require both an 18-month subscription to Sky Entertainment for £20 per month and the Sky Sports add-on plan for £18 per month. Sky Sports Action will show the undercard from 7pm BST with coverage of the Khan vs Lo Greco fight at 9:45pm BST. If you're not at home, or would simply prefer to watch the fight from your phone or tablet, then you'll need to download the Sky Go app and use your normal Sky login details. If you're not already a Sky Sports subscriber, then the cheapest way to watch the fight in the UK is via Now TV by purchasing a Sky Sports Day Pass for £7.99 ($11.45 US). With the pass you can watch Sky Sports for 24 full hours which will give you plenty of time to tune in for the undercard matches as well as the Khan vs Lo Greco fight. Also, you’ll be able to stream the fight on all of your favorite devices including your Apple TV, PlayStation, Xbox, Roku, computer or even on your smartphone. If you haven't already heard of this sport streaming service (and you won't be alone) DAZN is a streaming service available in Canada, Germany, Austria, Switzerland and Japan. If you're in one of these countries, you can sign up to watch Lo Greco go to-to-toe with Khan. It costs $20 a month or $150 a year. But the best news is that you can actually watch the bout absolutely free by signing up for a one month free trial. So if you have no interest in subscribing to DAZN and haven't had a trial before, then you won't have to pay a penny to watch. Unfortunately, you need a credit card from one of those countries to sign up. US boxing fans will be able to watch the Khan vs Lo Greco fight on ESPN’s new streaming service, ESPN+. The service has a wide variety of live sports available including MLB, MLS, NHL and of course boxing. ESPN+ is just $4.99 (around £3.50) per month and even if you have a cable subscription with regular ESPN TV channels the Khan vs Lo Greco fight will unfortunately be exclusive to the new streaming service. However, the company is offering a 30-day free trial so that you can test it out for yourself. We've looked and we've looked (and we've looked) and we can't find any news of a broadcaster in Pakistan showing Amir Khan in all his mean, lean glory this Saturday. Not great if you're there and were hoping to stay up until 2am local time to see if he can get back to winning ways. If that changes, we'll be sure to let you know. The only alternative is to use one of our best VPNs as described above, set your location to a country on this page that is broadcasting and go from there. But do bear in mind that most paid streaming services do require a credit card based in the country the service is from. Like in the UK, Sky has the rights to show the Khan vs Lo Greco fight live in New Zealand. It's due to air at 9am Sunday morning on Sky Sport 2 (following a four hour build-up and undercard), so it will give subscribers something to watch over your lazy breakfast. Sky doesn't come cheap though, costing $54.81 at the very least to get a subscription that includes Sky Sport. Similarly to the UK, you can download the Sky Go app to watch away from your TV set. How do I watch Khan vs Lo Greco in Australia?